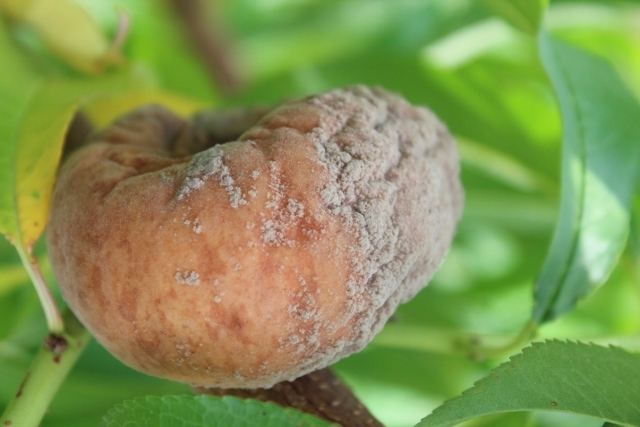 Abundant rainfall and warm temperatures can lead to an increase in the presence of brown rot on stone fruits (peach, cherry, plum, nectarine), which results in rotten, inedible fruit. Early season management can reduce initial sources of the fungus as it emerges from dormancy. Management of early infections results in less disease incidence later in the season. 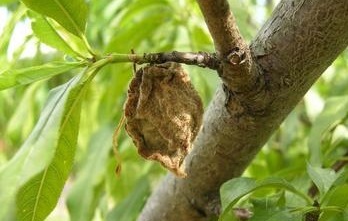 Symptoms include soft, brown fruit decay (Figure 1). Twig blight and blossom blight may occur in spring. All stone fruits are susceptible. Infection can occur throughout the growing season, during harvest, and in storage. Fruit is more susceptible as it matures. Periods of warm, wet or humid weather may result in higher disease incidence. Caused by the fungus Monilinia fructicola. The pathogen overwinters on rotted fruit (mummies) (Figure 2) and blighted twigs from the previous season. Apply fungicides such as captan or chlorothalonil beginning at petal fall. Always follow label directions when utilizing fungicides. Remove and discard decayed fruit and mummies as soon as possible. Prune and discard blighted twigs after harvest. Avoid fruit injury (e.g., from insects or damage during harvest). Increase air movement in tree canopy by selective pruning to speed drying after rain events.